Incredible photo! Thanks for sharing Bill. What a great find. Also visible and worthy of a detail photo: the St. Charles Hotel, with its mansard roof, can be seen directly in line & right of the sidewalk rail. Great photos capturing the feeling of the waterfront in the 1890’s! 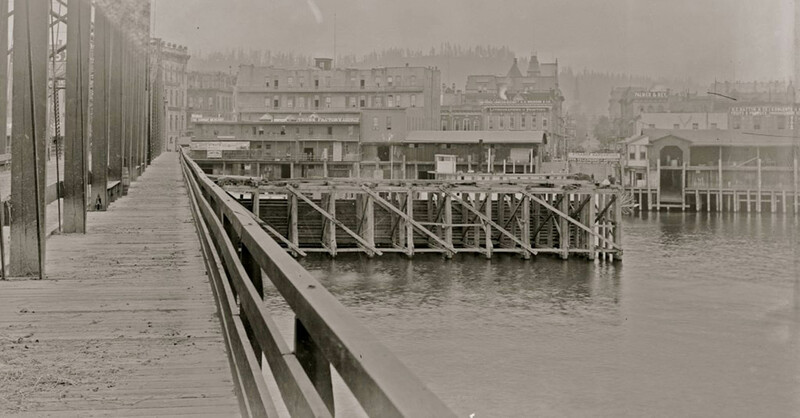 I understand that this bridge in the foreground would be either Madison Bridge #1 or #2 which (obviously in photos, being built of wood), burned in 1902 and was replaced with today’s 100 yr old Hawthorne Bridge. Does anyone know about Madison 1 and 2? Good view also of the two-level loading docks: one for high water, one for low water. Just to be clear, Tom Robinson at the Historic Photo Archive scanned the negative for me. At my Flickr account I also linked to a photo of the same general area but taken around 40 years later. This is a great photo. I can almost smell the wood and river. Hardly recognizable as the Portland I grew up in. @Mike G: Morrison, not Madison (Hawthorne)? What church steeple is that barely visible in the distance? Amazing! Would love to share some of these in our magazine sometime. 2 of the coolest photos I’ve seen of old PDX. Yeah, the on-bridge pic is a real treasure. I haven’t seen any from this perspective. In addition to the St. Charles Hotel, you can see the Jennings Bros. Building to its left (from this perspective, you would walk right into the building) and the back side of the Esmond Hotel (Front and Morrison) to its right. 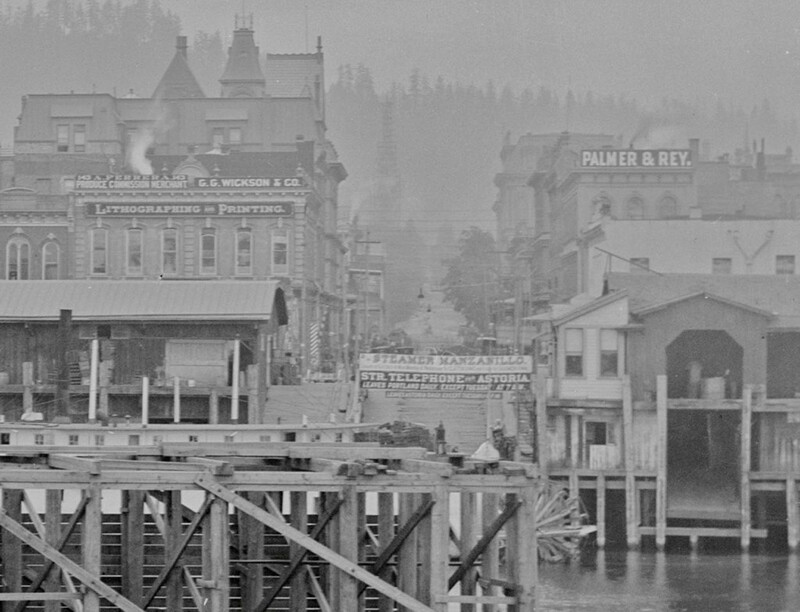 You can also see the clock tower of the Odd Fellows Temple (1st and Alder) peeking above the roof line left of the Steamer landing. Finally, in the distance, you can just make out the old Masonic Hall at 3rd and Alder on the right side of the street. Wonderfully detailed image. Thanks Ben. Oops. I mean Bill. Thank you Bill. @Tad: that is the First Presbyterian Church on 12th and Alder. It almost looks like there might be scaffolding around the steeple. The cornerstone was laid in 1887. RE: Madison, Hawthorn, Morrison? What I read indicated that there were two bridges extending from Madison street (No.1 and No. 2), replaced with the Hawthorne. That’s kind of what I was confused about too. @ Mike G: This isn’t the Madison/Hawthorne Bridge at all. This is the original Morrison Bridge, replaced in 1905 and again in 1958. Yes, there were previous bridges at Madison including one that burned and was replaced by the current Hawthorne. The bridge in this photo, however, has nothing to do with those. I tell you what, this is one of my very favorite images on the whole site. My bias is against pictures after about 1950 (not old enough) for architecture and this picture is so great with the terrain and the detail and the buildings and how very different is from nowadays. More older pictures please!! !